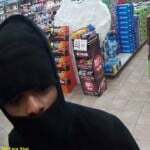 Police say a man wearing a black mask and black hooded sweatshirt entered the store around 3:15 a.m. Friday. MOORHEAD, Minn. — Moorhead Police are looking for a man who robbed a Holiday gas station store in Moorhead at gunpoint early Friday morning. Authorities say a man wearing a black mask and black hooded sweatshirt flashed a gun inside the store around 3:15 and demanded money from employees. He ran with an undetermined amount of money. If anyone has any information, contact the Moorhead Police Department.